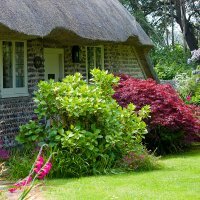 Here are a few simple terms that are essential if you want to make sure you are getting the kind of plant you expect. In the eyes of many gardeners, impatiens are the perfect garden plant. They thrive in partial to heavy shade. Double impatiens are becoming more popular each season. Their performance is best in pots or baskets rather than for bedding purposes. Biennial: A two year plant - biennials spend their first year growing stems and leaves, and flower in the second year. These are not great plants for instant gratification. Hollyhocks are the backbone of the old-fashioned cottage gardens with stately spires of large, delicate, wide open and round flowers. Extremely tough and drought tolerant. Colourful spikes can grow 2 metres high, perfect for back borders or massed in beds near the house. Perennial: A plant that will come back year after year, getting larger as years pass. Some perennials do not flower in their first year. 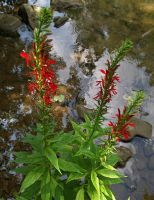 The lovely cardinal flower forms brilliant spikes in incandescent scarlet-red. Large, lovely bird-like florets cover metre tall spikes like butterfly wings. Grows anywhere, adored by birds and butterflies. Look absolutely lovely as cut flowers as well.